The lake has a good stock of fish including Carp to 43lb 8oz, Catfish to 70lb, Zander to 19lb, Tench to 6lb, Crucian Carp to 5lb and Roach to over 1lb. The grounds extend to 7 acres including 2 meadows with fruit trees, which provide a haven for butterflies' and birds. The log cabin is situated down a meandering 180 metre private drive, and is totally secluded by trees. 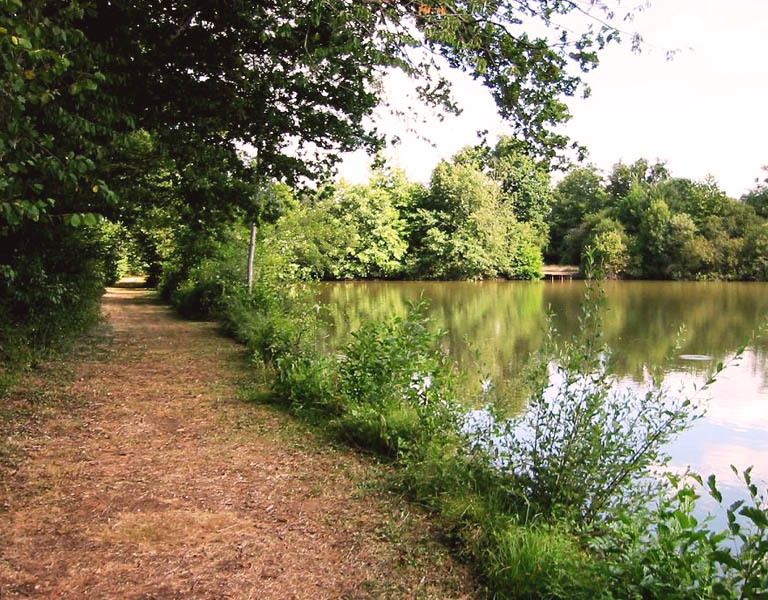 Etang La Ridelee is situated in the Mayenne region of Northern France and is a beautiful and tranquil private 55 year old, 5 acre Carp fishing lake, with its own private 2 bedroom log cabin accommodating up to 4 people. There is a small town 5 minutes away, with all amenities including restaurants, boulangerie and a supermarket with a petrol station. 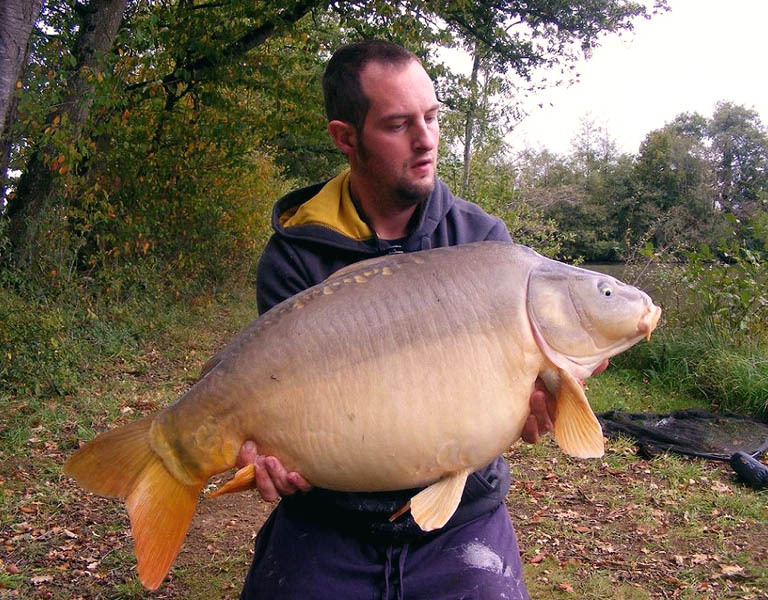 If you are looking for a low cost, self catering, quality carp fishing holiday in France, then why not stay at Etang La Ridelee? It is ideal for both experienced and novice anglers, while our facilities make it an excellent choice for families, small groups, as well as catering for the individual angler. 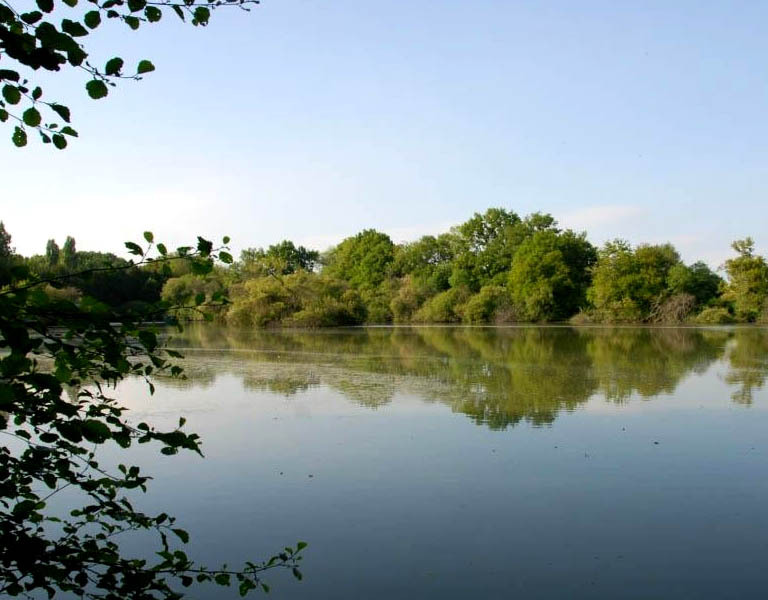 Exclusive use of our private fishing lake and grounds totalling 7 acres for £900 per week for up to a maximum of 4 people (which is £225 per person per week based on a group of 4). 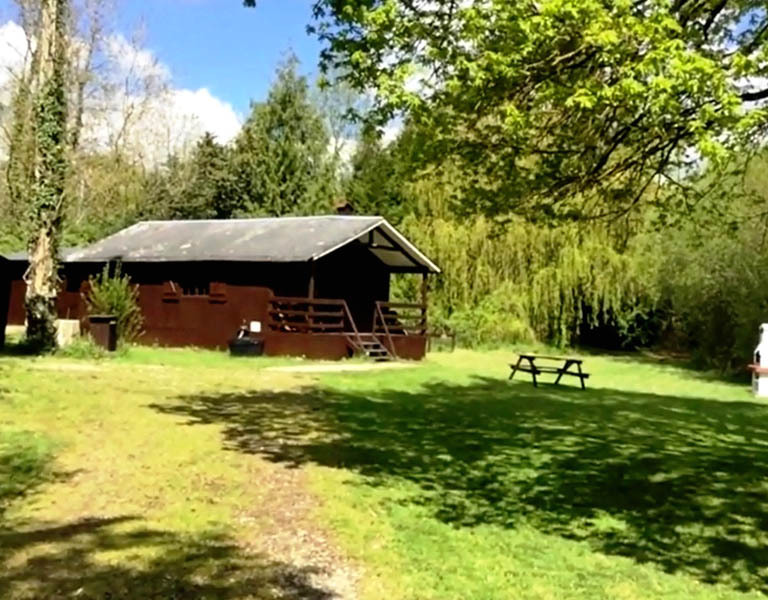 2 Bedroom Log cabin, which sleeps up to 4 people, with Shower room, Kitchen with cooking facilities, including Fridge/Freezer, Oven, Microwave, also Satellite TV, DVD player and Bait Freezer. Current stock of Fish include Carp to 43lb 8oz, Crucians to 5lb, Zander to 19lb, Catfish to 70lb, Tench to 6lb, Roach to over 1lb, Bream to 6lb, Rudd, Pike and Perch to unknown weights. The lake lies in a sheltered location totally surrounded by trees. Depths vary from 2-3ft at the shallow end of the lake and 6-7ft at the deeper end of the lake. On warm sunny days, you will be greeted early in the morning by the kingfishers flying at top speed from their favourite branches and the tiny tell tail bubbles gently breaking the surface of the lake showing that the Carp are looking for breakfast. There is one island which is within casting distance where fish, especially carp, can usually be found and a second island with access via a bridge which is ideal for stalking. There is a boat and a lifejacket available for the use of guests, however this is made available on the basis that guests must take 100% responsibility for their own safety. The lake has a good stock of fish including Carp, Catfish, Crucian Carp, Bream, Roach, Rudd, Tench, Pike, Perch and Zander. 276 double figure Carp have been introduced over the last few years. The current lake record for the largest Carp is 43lbs 8oz. The current lake record for the largest Catfish is 70lbs. Largest Zander landed is 19lbs. Largest Crucian landed is 5lbs 8oz. The grounds extend to 7 acres including 2 meadows with fruit trees, which provide a haven for butterflies' and birds. There is a path totally encircling the 5 acre fishing lake. The grounds are totally secluded and surrounded by trees and bushes. There are 7 comfortable sized swims where bivvies can be erected. 5 of the Swims have platforms – A rod pod is strongly recommended in these swims. If you don't have one, then we suggest you either buy one or borrow one from a friend. The log cabin is situated down a meandering 180 metre private drive, and is totally secluded by trees. At the end of the drive there is space to park 2 cars. The cabin is situated about 30 metres from the edge of the fishing lake and is slightly elevated to take advantage of the beautiful views of the lake. Within the cabin there is everything you need for self catering, including pots, pans & crockery. No bed linen, blankets, duvets, pillows, mattress covers, towels or tea towels are provided, so you need to bring your own. The layout of the cabin includes Lounge, Kitchenette, Bedroom1, Bedroom 2, Shower room and Covered veranda. Beds consist of 2 single beds in bedroom 1 and 2 single bunk beds in bedroom 2. (Please note we only accept bookings for 4 guests per week) Facilities include gas hob, sink, fridge/freezer, oven, microwave, shower, toilet, satellite TV and DVD player. There is also a dedicated bait freezer. There is a BBQ, a Summerhouse and 2 outside picnic tables also available for the use of guests.